A woman I know really well, who isn’t prone to flights of fancy, told me that an angel appeared to her during the night to reassure her that the problem she was wrestling with would be solved the next day. She was wide awake and lying in her bed when a man suddenly appeared. He didn’t look like the portraits you see of the Archangel Gabriel holding a trumpet and sporting a huge set of wings. This mystical being was an average looking fellow with sandy coloured hair and wearing typical casual street clothes. “Don’t worry. It will all work out.” was his message and then, he vanished. She wasn’t afraid, and true to his word, the next day, the problem resolved. I am not a New Age philosopher. Yet I too have had an experience that could only be described as divine intervention. It was 30 years ago and I remember it like it was yesterday. And I will swear that this ‘miracle’ was the only thing that stopped me from peering over St. Peter’s shoulder to see if my name was written in the book that would open up those pearly gates. I think it is precisely because of personal interventions like these, that angels continue to inspire and fascinate. 234,000,000 results. That’s how many references Google churns out when you type ‘angels‘ in the search engine. If you go directly to scripture, angels are talked about 116 times in the Old Testament and 175 in the New Testament. That’s a lot of ink devoted to these spiritual beings. They even get their own feast day – Saint Michael and All Angels celebrated on Sept 29th. Many religions have rich traditions celebrating in awe and sometimes fear the power and wonder of these mystical beings. During Advent we sing of the Archangel Gabriel and his message to Mary. Many hymns are dripping in purple prose, painting pictures of the company of Heaven – Cherubim and Seraphim giving praise to the Almighty. Rufus and Martha Wainwright, Kate and Anna McGarrigle, Tony Trischka, Jacob Silver, Casey Driese, Tim Robbins, Miles Robbins, New York City Labor Choir. St. Michael is the leader of the celestial army. In Islamic tradition Mika’il (Michaek) is depicted as having saffron hair from his ‘head to his feet and wings of green topas. Each hair has a million faces and in each face are a million eyes. Mika’il has a million tongues, each speaking a million languages’. For Christians, Archangel Michael’s name means ‘looks like God, or ‘Who is as God“. Painters portray him as a young strong angel wearing armour who is most famous for battling Lucifer, the fallen angel. The Koran tells the story of how God created Adam and commanded the angels to bow before man. Lucifer refused. Why should he, that which is created of fire, bow before a creature made of mud? God cast him into the pit of hell. 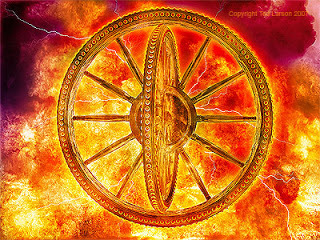 “When the cherubim departed, they lifted their wings and rose up from the earth in my sight with the wheels beside them; and they stood still at the entrance of the east gate of the LORD’S house, and the glory of the God of Israel hovered over them. These are the living beings that I saw beneath the God of Israel by the river Chebar; so I knew that they were cherubim. Each one had four faces and each one four wings, and beneath their wings was the form of human hands….” In the Old Testament, Ezekiel saw not one angel, but a host of angels. Pure raw energy, great balls of fire. ….and when they went, I heard the noise of their wings, like the great noise of great waters, as the voice of the Almighty. 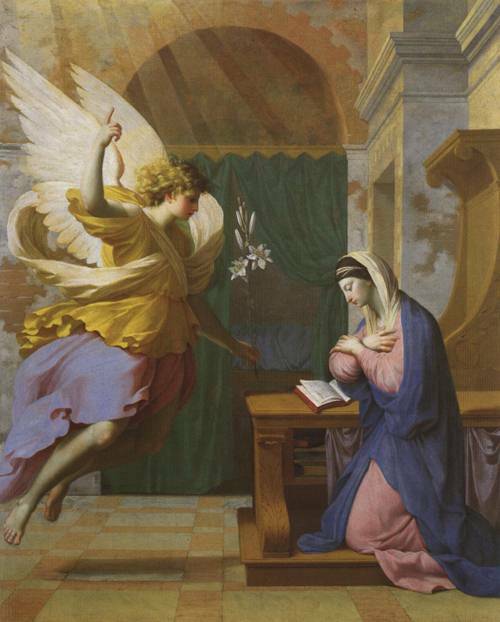 St. Augustine wrote, “Everything visible thing in the world is put in the charge of an angel”. 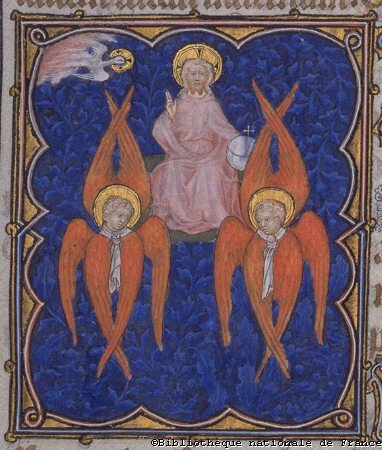 Seraphim and Cherubim, What are they? 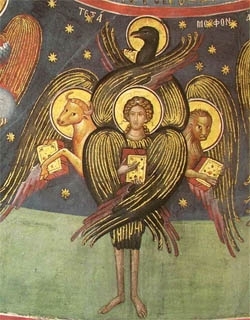 Seraphim were depicted by Medieval painters are red beings with three pairs of wings and swords of fire. Their business is to ‘inflame humans to divine love‘. 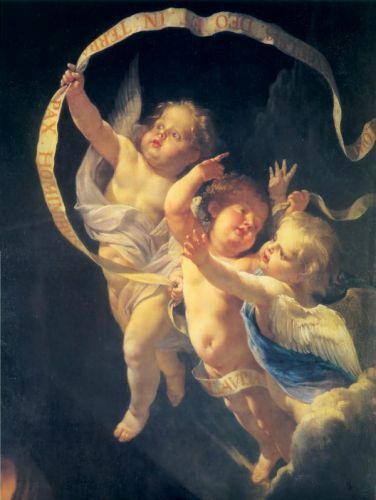 Cherubim means fullness of God’s knowledge. Originally Assyrian in origin, they offer praise to God continuously, night and day. 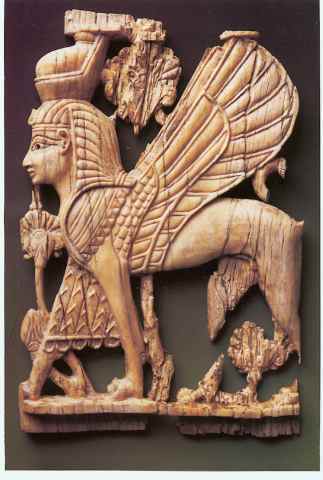 Winged creatures with either the face of a lion or a human, their bodies were like eagles, bulls or sphinxes. J.S. Bach composed his cantata Herr Gott, dich loben alle wir (Lord God, we all praise you) in 1724 for the feast day of St. Michael and All Angels. The text is based on the books of Revelation, Daniel and the Gospel of Matthew – Michael fights the dragon and angels see the face of God. Hubert Howells wrote his Sequence for St. Michael in 1961; for the 450th anniversary of the foundation of St John’s College, Cambridge. In this very special anthem, the cry ‘Michael, Michael’ resounds after the opening chords from the organ. Howells’ son of the same name died when the boy was only nine years old. This homage to Michael the Archangel also carries the pain Howells still felt 26 years later. “A Sequence for St Michael” by Herbert Howells (1892-1983). I’ll give the last word to William Harris and his beautiful anthem ‘Faire is the Heaven’. I’d love to hear about your stories of angels! And maybe, just maybe, I’ll share mine!